The perimeters of the swathe of untended jungle that was formerly Tyersall Park is marked by a fence (left) and Holland Road (right); the plot is 30 times the size of The White House, and hides the remains of two abandoned palaces. IN the heart of Singapore, there is a sprawling, vacant plot of private land 30 times the size of The White House. 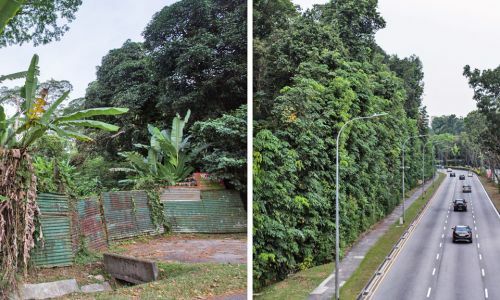 Just down the road from the US embassy and bordering condominiums worth as much as S$4.5 million per unit, the swathe of untended jungle hides the remains of two abandoned palaces and would be worth a cool S$4.7 billion if sold for development, according to one estimate. In a city where almost 8,000 people fit into each square km and real estate prices are among the world's highest, it is one of the greatest urban anachronisms in Asia. "Owning a piece of land in Singapore is certainly a privilege as land is the most precious resource in the city-state," said Christine Li, a senior director and head of research for Singapore at Cushman & Wakefield. "Over the past five decades, land prices have appreciated significantly. This has fuelled wealth creation for older generations. Many also aspire to own a landed property as it is a status symbol for the well-heeled." If something about this story sounds familiar, it is probably because the plot line was borrowed by Kevin Kwan, author of Crazy Rich Asians, the book about Asia's insanely rich that was made into a hit movie last year. The fictitious Young family inhabits a sprawling ancestral home, set within Singapore's Tyersall Park. In the real-life version, the 34-year-old Crown Prince of Johor, Tunku Ismail Sultan Ibrahim, is the registered owner of the 210,875 sq m plot, which lies in the former Tyersall Park, next to the Botanic Gardens. Inside, ravaged by fire and decay, are the ruins of Istana Woodneuk, the palace built by his ancestors in the late 19th century. The plot owned by the Sultans of Johor was once larger, but has gradually reduced as the Singapore government acquired land to extend the Botanic Gardens, a Unesco World Heritage site. In 1990, the state bought a chunk for S$25 million and it got another 98,000 sq m piece in 2009 for an undisclosed amount. Malaysia has a constitutional monarchy, where the national throne rotates between rulers of the country's nine states every five years. The southern state of Johor is ruled by the Crown Prince's father, Sultan Ibrahim Sultan Iskandar. Last year, the 60-year-old patriarch put 12 luxury cars from his extensive collection on display at an event held to mark the 90th anniversary of Singapore's Fullerton Heritage precinct. They included a 1991 Lamborghini LM002 and a 1938 Lagonda Lightweight LG6, the only one in the world. His other assets include a 22 per cent share in Malaysia's Forest City, a US$100 billion Chinese-built project with apartments on artificial islands in the country's south, and the family also owns stakes in a variety of public companies from 7-Eleven Malaysia Holdings to telecoms firm REDtone International. The Crown Prince, however, will not be able to cash in on his Singapore land any time soon, even if he wanted to. The undeveloped area is zoned for "special use of green space", meaning that development for other purposes - such as residential or commercial - is restricted. Were that to change - the land does sit in one of Singapore's most desirable residential districts - it could be worth at least S$4.7 billion, according to a calculation by Alan Cheong, a senior director at brokerage Savills. The most expensive residence to change hands in Singapore over the past year was a so-called good class bungalow (luxury landed houses that are off limits to foreigners) also near the Botanic Gardens. The property was purchased by Tony Tung, the chairman of oil trader Winson Group for S$105.3 million, The Business Times reported earlier this month, saying that it was a record for that type of dwelling.